← Are Millennials “Short on Brains” or are We Too Old To Understand This Generation? We scarcely have a month left here in Northern Nevada where we can jump into Lake Tahoe without our hearts stopping from the shock of ice-cold water. Yup, the end of August always signals the end of the Coppertone season. This week if took me longer to get to work – kids are back in school crosswalks. And when I went up to the box store to replace some potted flowers that I forgot to water; they only had orange and maroon fall Chrysanthemums and the patio furniture was replaced by Halloween decorations. My garden is in its full crazy ignored mess with cilantro gone to seed, overloaded tomato vines and massive dark green squash hiding … lurking. Even before we moved to a four season climate, it would always kill me to be home on a summer weekend. My husband’s the same – if we don’t have sore muscles from water-skiing or marathon paddle-boarding (to a bar on the lake), we’re not having a “good” summer. I grew up with parents who loved the water. As a kid, most weekends were spent at Lake Berryessa, in Northern California. It was a little less than a two-hour drive in our wood-paneled station wagon, windows closed, AC going, with my mom and dad chain-smoking their Winston’s. Most trips one of us, actually I think it was always me, would throw up. If it wasn’t the windy roads, it was the name of the marina before ours,“Sugarloaf,” that got me every time. We had a single-wide Fleetwood mobile home, perched on a hill directly above the lake. The air smelled of oak trees and hot baked dirt. My mom would shoo out the daddy long-legs that liked to gather in our bathtub before sending us out to adventure in our crispy, old Keds with the toes cut out. All the appliances were avocado colored and there was a huge dark green deck that ran on two sides, protected by an aluminum awning (that my dad built). From this deck we’d watch the whitecaps on windy days and the numerous ski boats on calm days. There was one fish as huge as a Marlin, that would jump out of the water on our arrival, only for us, every season. We’d get out the old binoculars just in time to see his fin disappear. One time, my dad got the timing just right and said he had glasses on like the Incredible Mister Limpet. I swear, it’s true. In the heat of the day, you could hear the weeds crackling, like they were so hot, they were breaking. Our first stop was the mysterious and wonderful bait and tackle shop, where we’d first check out the live minnows, frantic in the wooden tanks – which we never bought. Instead we’d buy squirmy night crawlers and top off the hook with one stinky salmon egg. That was our secret recipe. There was always cool things to look at, dust covered cans of Chili Con Carne and Deviled Ham and 99 cent flip flops and fisherman’s hats with the lake’s logo on them. Fisherman handle the weight or would I be dragged down? We’d stop back there after our fishing to get a black and white Polaroid picture posted on the wall, with our stringer full of fish. We’d lay down “two bits” for a Push-Up or an orange and vanilla Creamsicle for the dusty walk back home. (As you can see by the picture on the right, we didn’t miss too many ice creams). If we weren’t fishing, we’d go down to the little park on the lake and hunt through the trash containers. We’d create quite a fort with old carpet, broken lawn chairs, cardboard boxes and any other treasures we could find. We were inseparable during those years. And we weren’t alone all the time – really, the best part of the day was when my mom would show up in her yellow bikini, with her big toothy grin and freckled face, and swim with us. The smell of Coppertone, lake clams, fumes from an outboard, warm mud in stagnant water (the best place to catch frogs) – these aromas are like vintage perfume that I’d recognize in a second. Oh, and Lifebuoy soap. My dad didn’t swim (although that didn’t prevent him from going out in our little runabout). He’d walk down the steep 150 wooden stairs down to the beach; put a couple of cans of Coors in the water, tie a rope around him and float. No kidding, he’d have us toss him a bar of orange Lifebuoy soap and he’d bathe in the lake. My husband says that it must be a Portuguese thing (we share this heritage). When I think of my childhood summers, I think of that time. 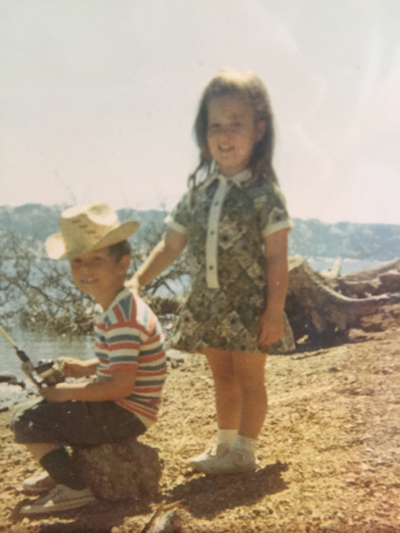 Before the big drought came and dried out our fishing cove, before my dad died when I was 13 and before my brother and I didn’t want to hang around with each other anymore, and you know, everything changed, for all of us. Maybe that’s why every year I try and recreate the time up at the lake, because it was really magical. And that’s how I choose to remember my family. Go out and play — and get the most out of the end of summer. What wonderful memories. No wonder you are such a happy person. I caught one fish in my life – by accident – it scared me and when I ran to tell everyone, I stepped on a bee and got stung. That was on Lake Ontario in upstate New York. 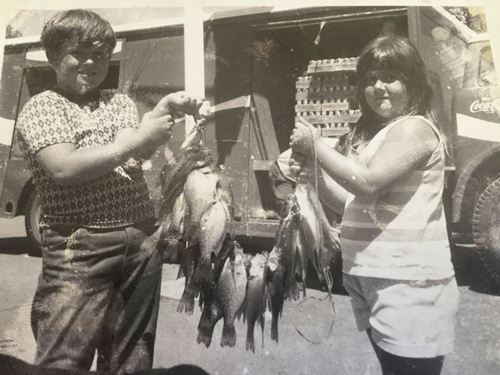 Summers there were fun but my brother and I never caught the quantity of fish like you did and we weren’t as cute either. Well, I can see why you don’t fish anymore -I think you have to have a good experience as a kid. As an adult I don’t fish anymore. Only a few times and I feel bad for the fish, especially doing catch and release. Hey Michelle – yo to my Canadian friend – I had to think about that for a second, but I do have a friends that take their kids out on adventures and limit their time on ipads and games and the tv. So I think there is still hope for kids to experience the smell of mud and campfires. You are so lucky to have such great memories and as usual you are a great story teller. I too have friends who often go camping with their kids, so I think hope is not lost for future generations.